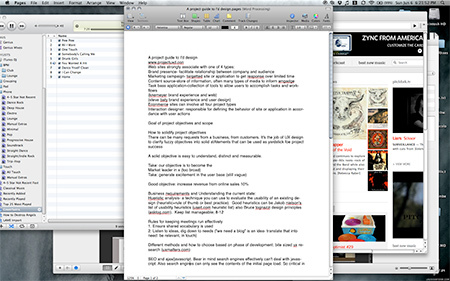 Whether in a work or play setting, we all run into scenarios where an extended writing session on the computer becomes necessary. 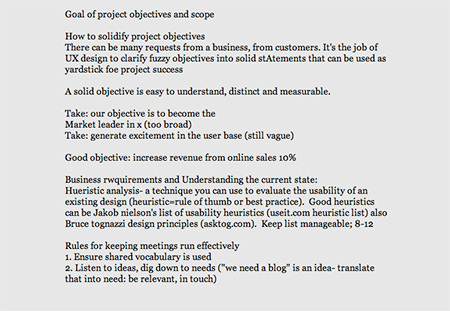 An extended E-mail to the boss, An outline for a presentation, and getting down thoughts from a brainstorming session down are a few common examples. Unfortunately, I’m convinced that many write in a way that’s too unorganized, too cluttered and too prone to distraction. For many there’s better, faster, minimalist approach that keeps focus on the task at hand using full screen, lightweight text editors like WriteRoom. As I’ve moved into progressively more creative industries the demands on me to write in a longer format have increased, though I’ve been writing long form, mostly for longer e-mails and creative brainstorms, heavily since my college days. Back then I’d usually crack open a full featured word processor like Word, with a bunch of other apps (music players, chat clients, web browsers) going full speed in the background as I’d multi task from time to time. However, a few years ago, I realized I wasn’t using 95% of the features or functionality in really any word processing app out there, so I decided to shave down most of my writing to a simple text editor. With this move my productivity got an immediate bump. I didn’t have an unnecessary set of toolbars, buttons or keyboard shortcuts to concern myself with. No jumping around for special commands for fonts or bullets. 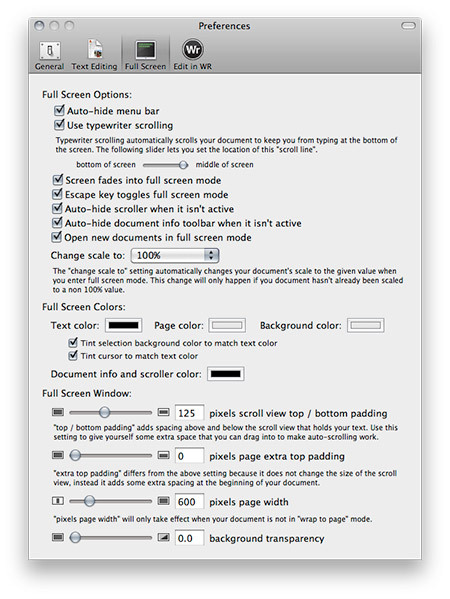 Everything was also now being saved in plain text, which eliminated Mac vs. PC and cross app compatibility issues. However, I was still getting distracted with the many apps I had around the main text editor in the center of my workspace. Closing many of them completely wasn’t a option: I still wanted e-mail notifications, for instance. Even in minimized state, I still had a pretty colorful, busy desktop. I wanted a text editor could go one step further and block out these distractions in a quasi-full screen mode. In early 2008 my wish was granted. 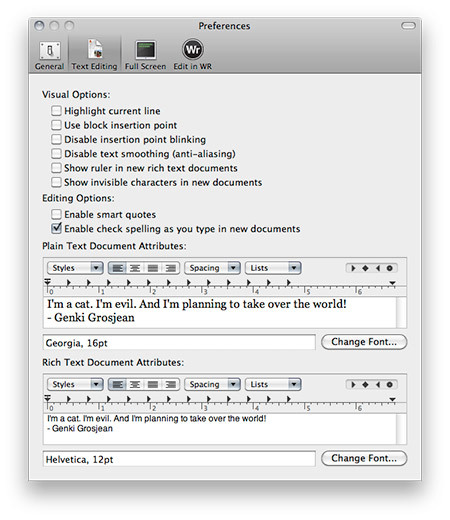 Enter the text editor that would change my writing habits significantly: WriteRoom. The beauty of Writeroom and the other similar, full screen, spartan text editors is there is no margin settings, no font adjustments, and there’s well, basically nothing on screen except for the text (not even the menu bar unless it’s explicitly called via mouseover.) I can’t fully control the outside world but in terms of my machine, at this point, there’s literally nothing between myself and what I want to write. It’s pretty awesome stuff. Close all applications that are not absolutely necessary for the block of time I’ve set aside to write. That generally leaves just my music player and an E-mail client left. As necessary transfer my final thoughts to their final destination: Keynote presentation outline, body of a new E-mail, blogging software, and so on. Regardless if you use a Mac or PC, there’s currently three pretty great full screen, minimal editors out there: WriteRoom, DarkRoom, and Omniwriter. All are pretty similar, though Omniwriter has the most stylized, slick approach (complete with custom soundtrack and audible keyboard taps), at the cost of some customization. Cheap too – no option is more than $25, and all have free trial periods. Omniwriter, along with basically every word processor on the planet, has a less contrasty, dark on light palette. I prefer this over the Unix/terminal esque light on dark. Therefore, I changed a nearly pure black background and page color (technically 5% brightness, or #0d0d0d in hexadecimal) to a slightly mellow white/grey (88% brightness, roughly #e5e5e5). Text naturally was inverted as well from pure green (#00ff00) to a pure black (0%, #000000). I didn’t care as much for WriteRoom’s default font setup either. I’ve switched all documents to use two classics, both fully embraced by Omniwriter: Helvetica and Georgia (I flip between the two, the former sans serif, the latter serif, depending on my mood), each at 16pt size for readability. I really appreciated Omniwriter’s approach as well of keeping text very centered vertically on screen, with large top and bottom padding. To implement this I increased the default 25 pixel scroll view top and bottom padding to 125. I also found the “page extra top padding” that WriteRoom has set by default to be a bit awkward. 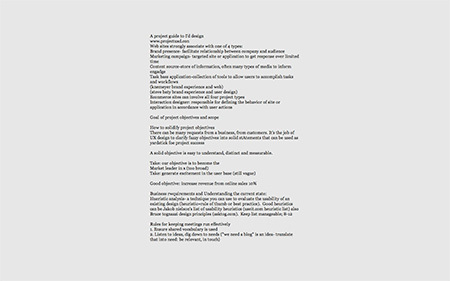 You get a big padding at the beginning of the document which goes away when you scroll down. I simply removed this by reducing this extra top padding to zero. All other WriteRoom settings were left at their default values. I’ve included screenshots of my preferences below for easy consumption.